Leon Bradford was born December 5,1905 and raised at Ray City, GA. He was a son of Mack Talley Bradford and Margaret R. “Maggie” Gaskins. His parents owned a farm on the Nashville & Valdosta Road, in the Connell’s Mill District near Ray City. Leon and his brothers all attended school when they were of age. When Leon was about 13 years old, his father fell off a ladder. Although Mack Bradford’s injuries from the fall seemed minor, in just a short time he was dead. For a time, Leon’s mother continued to farm the family place near Ray City. Leon’s older brother, Albert Bradford, worked as a farm laborer. It appears that after the 8th grade, Leon Bradford had to give up school. By 1930, Leon’s brother, Albert was married and had a place of his own. Leon’s mother moved with his two younger brothers to a farm at Cat Creek, GA, about ten miles southwest of Ray City. Leon moved into town at Ray City and took up the trade of barbering. In 1930, he was boarding with Pleamon and Minnie Sirmons in their Ray City home. About 1934, Leon married and in 1935 Leon and Dora Bradford became the parents of Patricia Bradford. The Bradford home was on Main Street in Ray City. They were neighbors of Hun and Gladys Knight, and the Knight’s boarders Hazel Tabor and Dorothy Chisholm who were both school teachers. Other neighbors of the Bradfords included George and Cynthia Swindle, Raymond and Jeanette Philipps, Marvin and Arlie Purvis, and Garth and Jessie Mae Webb. Patricia Bradford attended the Ray City School. Leon Bradford had his own barbershop, located on the south side of Main Street just east of the tracks of the Georgia & Florida Railroad. Just across the street was the Victory Soda Shop and next door was the grocery store owned by Marvin and Arlie Purvis. A few doors down was another barber shop owned by Lyman Franklin Giddens. On Saturdays, Wayne Putnal worked at Bradford’s barbershop cutting hair and giving shaves. Leon Bradford spent his career grooming the citizens of Ray City, GA. It appears the Bradfords were Methodists. Patricia Bradford attended the Methodist retreats at Epworth on St. Simon’s Island, GA. Like his father before him, Leon Bradford was an active member of the Masons. Leon Bradford died May 27, 1962 in Berrien County, GA. He was buried with others of the Bradford and Gaskins family connections at Fisher Gaskins Cemetery, located on Bradford Road six miles southwest of Ray City, GA. In 1950, the Methodists of south Georgia established a religious center on the Georgia coast. Epworth by the Sea began as “a small rustic camp facility with a few old plantation buildings” on St. Simons Island. 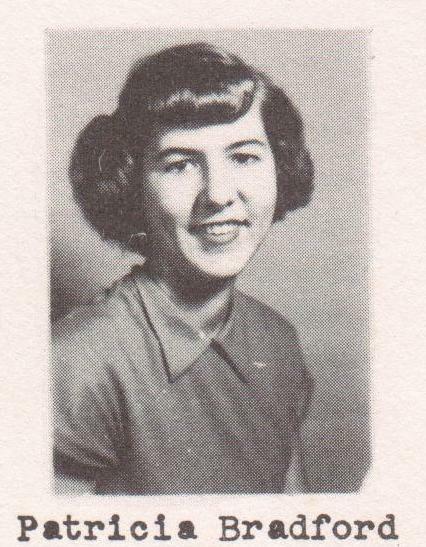 Patricia Bradford attended a retreat for Methodist youth at Epworth by the Sea, St. Simons Island, GA. 1951 Junior Class portrait, Ray City School, Ray City, GA.
Young Methodist from all over the state were drawn to the new retreat center, and in the summer of 1951 two young women from Ray City, GA attended the annual retreat. Miss Betty Jo Webb and Miss Patricia Bradford attended the annual district officer’s retreat on June the 7, 8, 9, and 10. The event was at Epworth by the Sea, the Youth Center for Methodist Young people on St. Simon’s Island. Betty Jo Webb and Patricia Bradford lived in neighboring houses on Main Street in Ray City, GA. Betty Jo Webb’s parents were Garth Webb, Postmaster of Ray City, and Jessie Francis Webb, a teacher at the Ray City School. Patricia Bradford’s parents were Leon Bradford, a Ray City Barber, and Lula Eudora Bradford. Patricia Bradford later married Ray City lumberman Thomas Studstill, a son of Thomas Julian “Boots” Studstill and Maudell Vaughn Studstill. 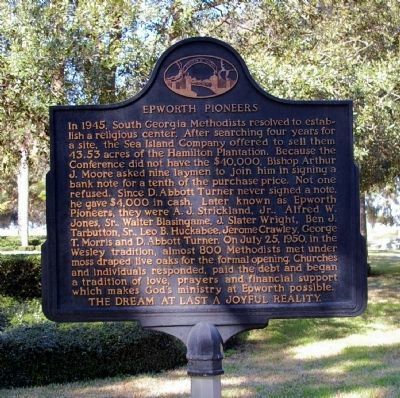 The historical marker at the site of Epworth by the Sea describes how the center was founded. In 1945, South Georgia Methodists resolved to establish a religious center. After searching four years for a site, the Sea Island Company offered to sell them 43.53 acres of the Hamilton Plantation. Because the Conference did not have the $40,000, Bishop Arthur J. Moore asked nine laymen to join him in signing a bank note for a tenth of the purchase price. Not one refused. Since D. Abbott Turner never signed a note, he gave $4,000 in cash. Later known as Epworth Pioneers, they were A.J. Strickland, Jr., Alfred W. Jones, Sr., Blasingame, J. Slater Wright, Ben J. Tarbutton, Sr., Leo B. Huckabee, Jerome Crawley, George T. Morris and D. Abbott Turner. On July 25, 1950, in the Wesley tradition, almost 800 Methodists met under moss draped live oaks for the formal opening. Churches and individuals responded, paid the debt and began a tradition of love, prayers and financial support which makes God’s ministry at Epworth possible.